Ancient and modern, with equal measures of grunge and grace, bustling Athens is a heady mix of history and edginess. Iconic monuments mingle with first-rate museums, lively cafes and al fresco dining – and it’s downright fun.The historic centre is an open-air museum, yet the city’s cultural and social life takes place amid these ancient landmarks, merging past and present. The magnificent Acropolis rises above the sprawling metropolis and has stood witness to the city’s many transformations. Despite financial difficulties in recent years, tourism in Athens is on the rise once again, with the city reclaiming its spot as one of the top destinations in Europe. While most tourists pass through the city on their way to the Greek islands, Athens is a worthy destination in and of itself. It is the birthplace of democracy and has survived centuries of loitering, wars and occupation. 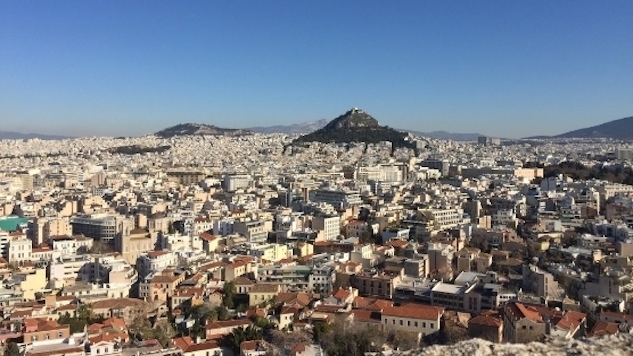 Today, Athens is home to a diverse population and experiences ranging from exploring the ancient Acropolis to eating an authentic gyro on the streets of Plaka. We’ve compiled a list of 10 free activities in Athens. Sprinkle these freebies throughout your itinerary and you’ll be sure to have an affordable and memorable trip. Syntagma Square is one of the busiest squares in Athens, with a constant flow of traffic and people. The Tomb of the Unknown Soldier, which lies at the foot of the Parliament building, is guarded 24/7 by the Evzones, an elite branch of the Presidential Guard chosen for characteristics such as height and physical ability. Like the Buckingham Palace Guards, the Evzones are unable to move while on duty. The sole exception to this rule is the hourly changing of the guards, which takes place to the minute, every hour on the hour, and is a fine display of pomp and circumstance. —The Academy of Athens, The National Library of Greece and The National and Kapodistrian University of Athens. Entrance to all three buildings is free, though the hours vary by season. Even if you only linger outside, the buildings are a draw for photographers as they bear impressive facades and elaborate sculptures. 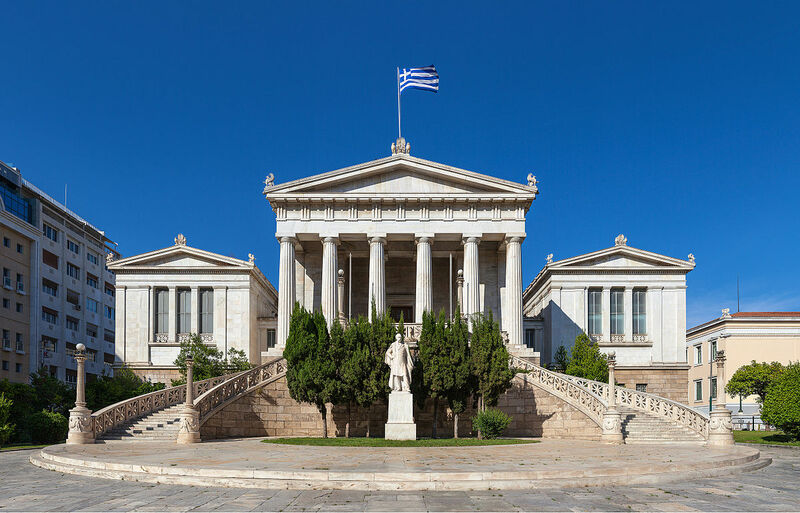 While the buildings are not ancient and were designed and built throughout the late 19th and early 20th century, they pay homage to the best of Greek architecture and Athens’ most influential citizens. The trilogy is also lit up at night, making this the perfect photo opportunity at any point throughout your day. Hidden at the base of the Acropolis is a tiny neighborhood called Anafiotika. The allure of the area is undeniable—whitewashed houses and blue doors/windows make this 45-house community a slice of the islands in the middle of a sprawling metropolis. You will find many traditional cafe there, and you should stop by for a coffee. Lycabettus Hill, or Mount Lycabettus as it’s sometimes referred to, is the highest point in Athens, rising 920 feet above the city. Legend has it the goddess Athena created the mountain by throwing a rock out of the sky. If you want a bird’s-eye view of the city, you’ll find no better spot. While the funicular costs seven euro, you can hike the mountain for free, or drive up if you have a rental car. There is ample parking and, once there, you can stroll through trails and walkways to further explore the mountain. Have a drink at one of the restaurants and enjoy the view (pictured at top), just be alert when walking around the area at night. 5. Go for a walk to the beach.. If you take the tram from Syntagma square you can go to the beach very easy in 20 min. You can hear live music on every corner of Athens—literally. Try strolling down Adrianou Street just below the Acropolis. During the day, you’ll find no shortage of street performers crooning for tips.If you’re looking for some Greek music to accompany your meal, Kapnikarea Café is a favorite of locals and a frequent stop on city nightlife tours. They have live music almost every evening. There’s nothing quite like swaying to the sounds of a bouzouki in their cozy, dimly lit outdoor annex. 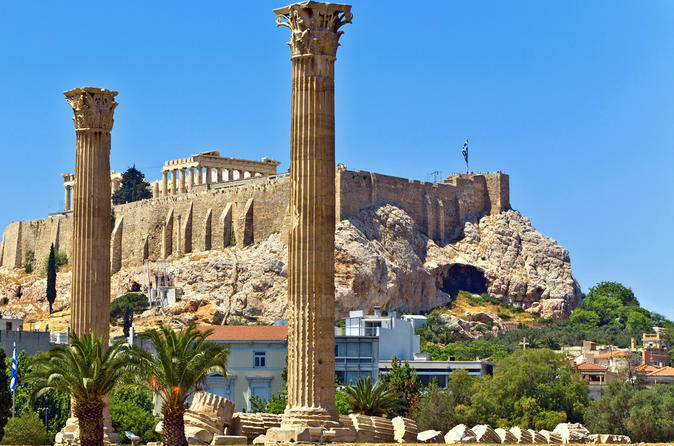 Athens has no shortage of monuments, some without entrance fees. Hadrian’s Arch, built to welcome Roman Emperor Hadrian in the first century, marks the line of the ancient city wall and stands proudly at the end of Amallias Avenue. You can walk up to the monument day or night, no ticket needed. The Monument of Lysicrates in Lysicrates Square was erected in honor of a wealthy patron of the arts and is one of the few remaining choragic monuments in Europe. It is free to visit and there is an information placard posted giving interested readers background about the monument. There are other monuments that, while they require paid admission, can actually be admired fully from the outside. The Temple of Zeus, for instance, can be seem from outside the gates and contains no additional detail upon entering—its claim to fame is its sheer size. 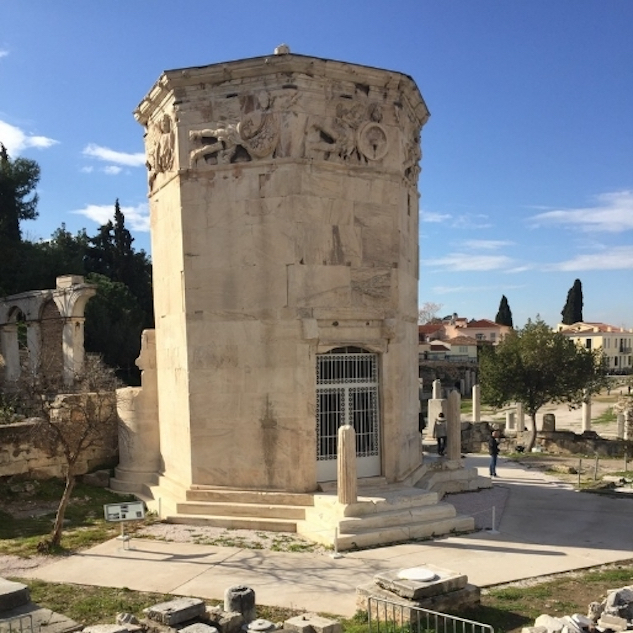 The Tower of the Winds (pictured above) at the Ancient Agora can be seen from the street, and there are signs hanging on the fence along the perimeter that provide details about the monument and close-up pictures of each directional wind god depicted along the façade. Not surprisingly, the vast green space in downtown Athens known as The National Gardens was commissioned by the first Queen of Greece, Queen Amalia. The woman’s touch is evident in the flower-covered arches, duck filled ponds and flawless landscape. The National Gardens are open from sunrise to sunset and completely free to the public. 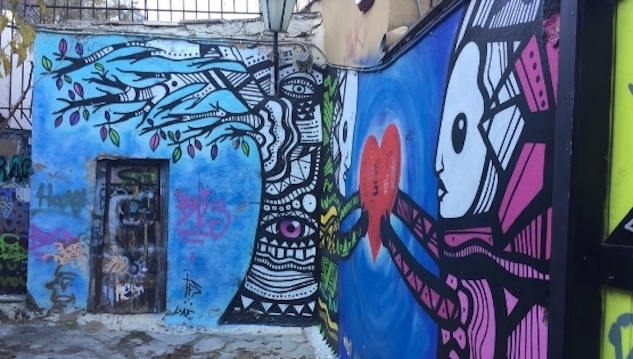 If you like street art, then Athens will be your urban playground. The city is covered in elaborate pieces, many of which comment on the state of finances and politics within the country. Today, groups spend two to three hours strolling alleys to admire the craftsmanship and message behind these unconventional works of art. It is free to all who know where to look. Start at the base of Anafiotika for some breathtaking murals & never forget to stop by and take photos! !